Trajal Harrell started by igniting the American and European stages with an incredible series of "dance-fiction”, available in several sizes (from solo to group pieces) and developed over several years : Paris is Burning at The Judson Church, where conceptual experiments of Postmodern Dance clash with lascivious poses of Voguing, derived from the African-American and Latino underground culture. With The Ghost, Harrell starts a new body of work and invents an even more improbable meeting - which promises many choreographic explosions. 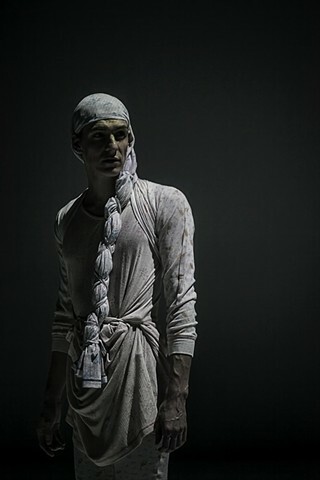 We might imagine that the ghost of Montpellier is Dominique Bagouet, renowned figure of 80’s New Dance; and the samurai is Tatsumi Hijikata, the founding father of butoh, but the work is full of surprises. Two legends of contemporary dance, a pretext for an irreverent tribute to say the least and an elerifying performance: on stage, the grace and energy of this family of dancers is truly staggering.